Sugar Skulls’ status in popular culture: What is their meaning and where do they originate from? 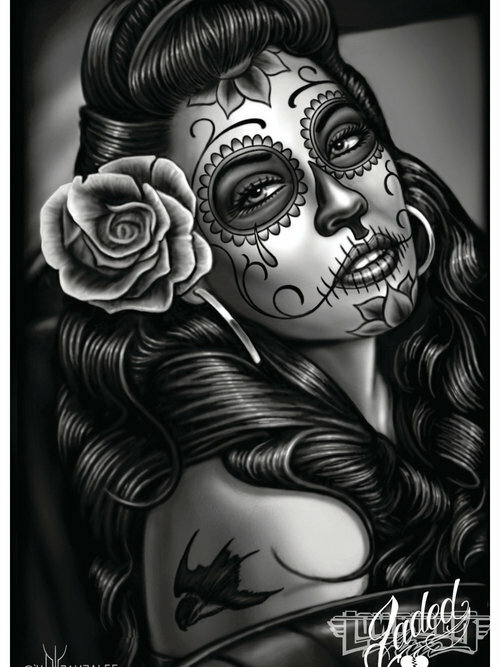 Lately, I’ve noticed the growing popularity of skulls and sugar skulls in Western culture – you can find them in all shapes and sizes plastered all over t-shirts, as ornaments in jewelry, illustrated in graffiti or tattooed on someone’s arm. Yes, skulls are definitely gaining mainstream popularity but have you ever though about the origins of sugar skulls or what exactly do they represent? I’m thinking not, as I highly doubt that half the people who have them printed on a piece of clothing have ever bothered to do some simple research into this fascinating subject. Within the Western culture, skulls usually depict the dark, macabre and gruesome death. 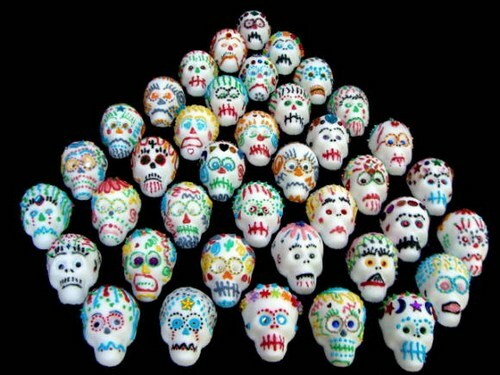 However sugar skulls’ origin (or calaveras de azucar) springs from Mexico. Day of the Dead (Dia de los Muertos) is a Mexican holiday, celebrated on the 1st and 2nd November in connection with the Catholic holidays of All Saint’s Day and All Hollow’s Day. The festivities start at midnight on the 31st October. Sugar skulls are often used to decorate the gravestones of the deceased. The reason they are called “sugar skulls” is because the authentic sugar skulls were made out of clay molded sugar, decorated with feathers, colored beads, foils and icing. These sugar skulls are very colorful and whimsical, not scary at all. The name of the deceased relative could be written on the skull’s forehead and then put on the altar, accompanied by marigolds (the marigold is perceived as the flower of the dead), candles and maybe even the deceased’s favorite food and beverage in order to encourage and guide him back to earth. Smaller skulls are placed on the offrenda (altar) on November 1st, representing the children who have passed away. Larger, more detailed ones would then replace them on the 2nd November, which represent the adults. The departed are believed to return home to enjoy the offerings on the altar. The idea of this tradition is that the Mexican families choose to celebrate the lives of their dearly departed friends and relatives as an opposite to most cultures that tend to mourn the dead. The roots of Dia de los Muertos could be traced back to the Aztecs and their festival dedicated to the goddess Mictecacihuatl. The holiday has spread throughout the world with small differences – In Brasil, it’s called Dia de Finadosand and it is a public holiday that many Brazilians celebrate by visiting cemeteries and churches. In Spain, there are festivals and parades, and, at the end of the day, people gather at cemeteries and pray for their dead loved ones. There are similar observances found throughout European, African and Asian culture. In terms of meaning, the skull symbolizes death but in a positive manner. In Mexico it is believed that death is not the final stage in one’s life but rather a step forward into a higher level of conscience. For the Aztecs skulls were a positive symbol, not only of death but also of rebirth. Supposedly the symbolism of a sugar skull is rooted in the decoration around the eyes. Flowers are meant to symbolize life, while cob webs symbolize death. Burning candles set inside the eyes are a sign of remembrance. These items can also be used in combination to personalize the main focus of the skull as well. So there you have it folks! Now you know where the origin of sugar skulls lies and you understand a little bit more about their meaning. Thanks for posting this. I just heard the term “sugar skull” for the first time a few weeks ago when i asked about a gal’s tattoo. I’ve been wondering about it since. Glad to see it has a positive; rather than gruesome connotation. Hey there 🙂 you’re very welcome. I’m glad you found my article interesting. To be fair, the idea came to me, because there was not one source that outlined the story and meaning behind the sugar skulls. Since they’re trending, I decided that it would be a great idea to do some research and put all the info together. Also, most people think that these skull gals have a negative meaning, when actually, that’s not the case. HI there, I like that you mention the relevance of the decoration of the eye on the skull. I want to design a skull that symbolises the empowerment of women, to use within my Roller Derby club… can you suggest any emblems that would symbolise power and strength? This is a great post, very informative. I had gone to Wikipedia and was surprised they had so little information about sugar skulls. Just a small article and nothing about the artistic style and it’s usage in other media. I grew up in a town with a Mexican-American population so I had always seen them but didn’t know the exact usage and history, just as an image frequently associated with Dia de los Muertos. Now I’m seeing the imagery a lot, even in parody. I saw a sugar skull style Stormtrooper mask on a t-shirt. I would love to know who the artist is that made the beautiful skull in the middle of your article. The flowery one. I’m in Guanajuato, Mexico right now during Dia de los Muertos and I’m trying to gather as much information as I can about the various elements of the Mexican ritual. This was an interesting article and I really enjoyed the images. I’ve only seen a few painted faces so far, but nothing as detailed as what you have here! thank you for your interesting inquiry. i have recently gotten interested in the sugar skull. i went to Denver, Colorado, and saw my neice dress up with the interest of the sugar skull. i noticed that most of the susgar skulls have woman faces do you have little boy sugar skulls? my 10 yr old son passed away 14 yrs. ago and just recently i have found the sugar skull meaningful. Hello, I’ve been looking at different sugar skull designs and I came across this. 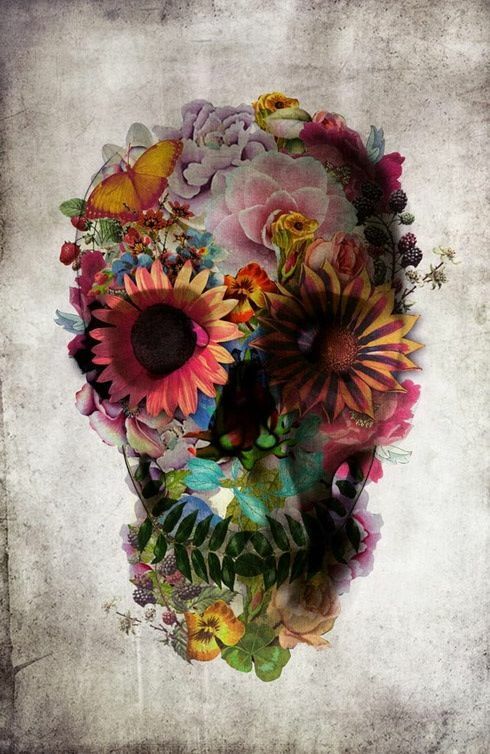 That second picture, the skull with the flowers, who is the artist? I literally have fallen in love with this picture and want it as a tattoo, but I want to make sure that the artist who has created it does not mind. Thanks! I didn’t mean to comment you, sorry! A little bit more research needs to be done. The italians are the ones that originally introduced sugar skulls to Mexican culture. “A litle bit more research needs to be done”? Uh! They brought over the idea of using sugar. This was because Mexico was rich in sugar but not money. The actual concept and culture of the skull still originates from Mexico. Thank you for the insight. I just heard the term ,and was intrigued by its meaning. Thanks for the article. We have a ratrod (custom vintage vehicle). It has a theme right now but wanted to do something different. The concept we are going to try is the “VooDoo Wagon” and we really wanted to incorporate the sugar skull. Thanks again! Well I hope you didn’t, since voodoo and sugar skulls have nothing to do with each other. I absolutely love the floral sugar shown in the 3rd pic. Can you tell me more about it, like who is the artist etc. Thank you! learn something new every day. thought it was a commin commercial stint. It’s very interesting, thanks for the article ! I’m so glad that finally somebody took their time to share this information exactly the way it is. I’m from México and I moved here to USA couple years ago and when started seeing people with tattoos, t-shirts or painting their faces with sugar Skull designs and they obviously don’t even know what that means or comes from I felt kinda upset about it. Seems like they feel so cool or bad assess using something that they don’t even know where it come from. But well I hope for this Halloween, people read this and learn the meaning before they paint their faces and tattoo their bodies. Great information. These images have really called my attention lately and I looked all over for information on where it came from. Glad to know that what touched me wasn´t simply a “fast fashion” tendency.